History has shown the importance of both robust and timely action in the face of mass atrocities. With this in mind, proponents of the United Nations Emergency Peace Service (UNEPS) aim to create a permanent standing UN military service to protect civilians in extreme risk. In today’s guest post, Annie Herro, a professor at the Centre for Peace and Conflict Studies at the University of Sydney and author of a new book about UNEPS, examines the proposal and highlights a path forward based on a range of interviews with UNEPS proponents and critics for this innovative, yet controversial idea. The UN has long been criticized for deploying peacekeepers “too little, too late” in response to conflict and mass atrocities. The gap between the number of peacekeepers promised by the UN Security Council and those actually deployed can be seen right now in the Central African Republic. Last April, the Council finally authorized a UN peace operation – MINUSCA – with a mandate to protect civilians, support a democratic transition and deliver humanitarian aid, but full deployment is anticipated for April 2015 – a full year after the UN gave the green light. A complete and robust mission was needed immediately to help end the violence. Late deployments are bad enough, but the failure to deploy a peace operation at all is also commonplace. In the case of Syria, there have been calls for a robust international response to honor the international community’s responsibility to protect (R2P) since the start of the fighting in 2011. Such calls have fallen on deaf ears. How can the international community’s ability and preparedness to prevent and halt atrocities and protect civil­ians be improved? How can we ensure that UN-sanctioned interventions are legitimate in the eyes of the intervened and do not tarnish the reputation and the norms of the organization they represent? 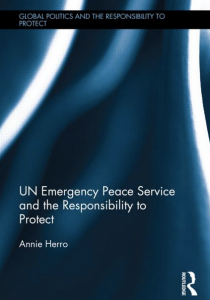 My book, UN Emergency Peace Service and the Responsibility to Protect, explores attitudes towards a possible answer to these questions: the UN Emergency Peace Service (UNEPS) proposal. UNEPS is a civil society-led proposal for a permanent service that would be directly recruited, trained, equipped and controlled by the UN. The UNEPS proposal is not the first attempt to create a permanent UN service – what some have called a UN ‘Legion.’ The idea has its roots in the inter-war years and since then has periodically resurfaced, championed by diverse actors in academic, diplo­matic and political circles. UNEPS would comprise citizens of member states acting in their individual capacity. It would have the ability to respond immediately to (immanent) crises, operating with a ‘first-in, first-out’ deployment philosophy, and would have a maximum deployment of six months. 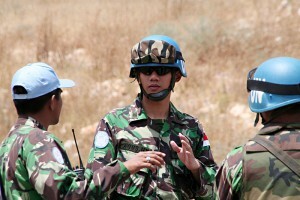 It would thus close the gap between the UNSC resolution sanctioning an operation and action. Having UNEPS readily available might also assist in obtaining UNSC authorization for the use of force and reduce unilateral interventions. 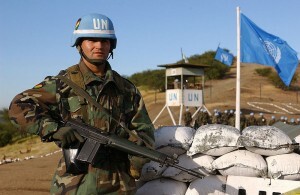 Since UNEPS would be self-contained with readily available personnel (around 15,000-18,000 civilians, police and military), equipment and supplies at the disposal of the UN, it could overcome governments’ unwillingness to expose their citizens and resources to security threats in countries perceived to be of little geopolitical significance. Such a rationale partly explains why UN peace operations can be under-resourced and unable to fulfil their mandate, as is playing out in the case of the UN-AU hybrid mission in Darfur, UNAMID. The UNSC would be the preferred mode of authorisation for a UNEPS. It would comprise individuals from a range of cultural, religious and geographical backgrounds and would be based at UN-designated sites, including field headquarters, functioning under a unified UN command. Such features are partly intended to facilitate better interaction with host communities and remove some of the neo-colonial stigma that is often associated with interventions. NATO’s intervention in Libya in 2011 bore the brunt of such accusation. Personnel would be carefully screened and have a range of professional and lan­guage skills covering areas such as human rights, gender, police, military service, humanitarian assistance, judicial proceedings and penal matters, conflict transformation and environmental protection and would operate within and enforce international humanitarian and human rights law. Given the diverse expertise of UNEPS’ members, they would perform a range of tasks in accordance with their mandate. Since part of UNEPS’ raison d’être would be to prevent and respond rapidly to atrocities, sometimes the robust use of force under Chapter VII would be required. It might, for example, secure safe areas for civilians and humanitarian assistance and engage in low-scale combat if necessary. It is not, however, designed for large-scale or sustained war fighting. Despite the apparent contribution of a UNEPS in providing the UN with a tool to operationalise the R2P, persuading govern­ments of the merits of the proposal is not without its challenges. This book is based on interviews con­ducted with political, military and non-state actors concerned with international peace and security issues and supplemented with other primary and secondary data sources. It considers the attitudes of such actors towards the UNEPS proposal and explores issues that might affect the estab­lishment of a UNEPS in theory and in practice. It concludes with some ideas about how the UNEPS proposal could best be designed and promoted in order to facilitate its eventual implementation. The book is structured around the norms and technical ideas on which the UNEPS proposal is based. Some of these norms closely relate—but are not identical—to the “three pillars” of R2P and include the imperative to use coercive and non-coercive means to protect civilians from mass atrocities. Unsurprisingly, some respondents were cautious about empowering the UN with a permanent capacity that could use force to uphold its mandate. They were cautious for different reasons including a commitment to non-intervention and territorial integrity, a belief in patriotic norms and difficultly accepting that an entity such as UNEPS would be truly independent of the inter­ests of powerful states. 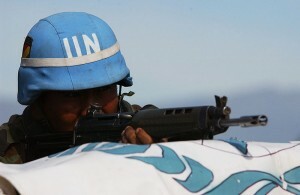 Others, however, were slightly more open to the idea for a standing UN service but seemed more comfortable with one that would operate in more permissive environments than R2P situations—where the consent of the state is essential and the mission is committed to being per­ceived as neutral by conflicting parties. Any robust military action to protect civilians would have to be reactive rather than preventa­tive. Such operations resemble what’s called POC (protection of civilian) Missions. Technical ideas raised by interviewees included the notion that that the size of the proposed service would be large enough to prevent the outbreak (or lessen the severity) of instances of atrocity crimes and that the cost of the service is a feasible and ultimately cost-saving investment for the international community in the area of post-conflict reconstruction. Ultimately, this book makes the case for “localizing” the UNEPS proposal so that it is more consistent with the attitudes of those consulted for this research. It argues that the development of a series of potentially less controversial proposals could be the first steps to creating a rapidly deployable service with the mandate to prevent atrocity crimes. * Summarised from Robert C. Johansen, ‘Expert discussion of the United Nations Emergency Peace Service: Cuenca Report’, in A United Nations Emergency Peace Service: to prevent genocide and crimes against humanity, ed. Johansen, 43-74 (New York World Federalist Movement – Institute for Global Policy, 2006). This paragraph also incorporates other literature on UNEPS. This entry was posted in Guest Preventer and tagged responsibility to protect, UNEPS on January 27, 2015 by admin.